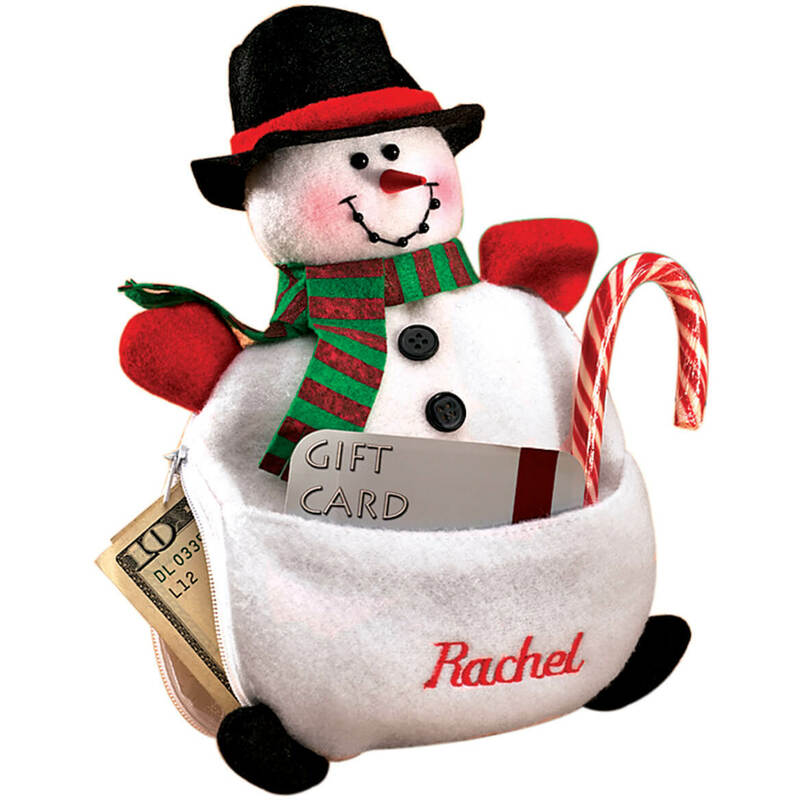 The personalized snowman money gift card holder is a cheerful winter friend that holds a special surprise in his zippered side pocket or round snowman belly (it’s a pouch!). Just tuck a gift card, money, candy or other small treasure in this personalized gift card holder. With recipient’s name embroidered in red, the holiday gift card holder is a festive ornament too. Specify name; limit 1 line, 12 letters/spaces. Polyester. 5 3/4″ long x 9″ wide. Making thoughtfulness wonderfully affordable, this Secular Christmas bookmark set makes it easy to spread a little extra Christmas cheer. Whether tucked inside stockings, greeting cards, books, or given on their own, each of there festive paper bookmarks make the season bright! 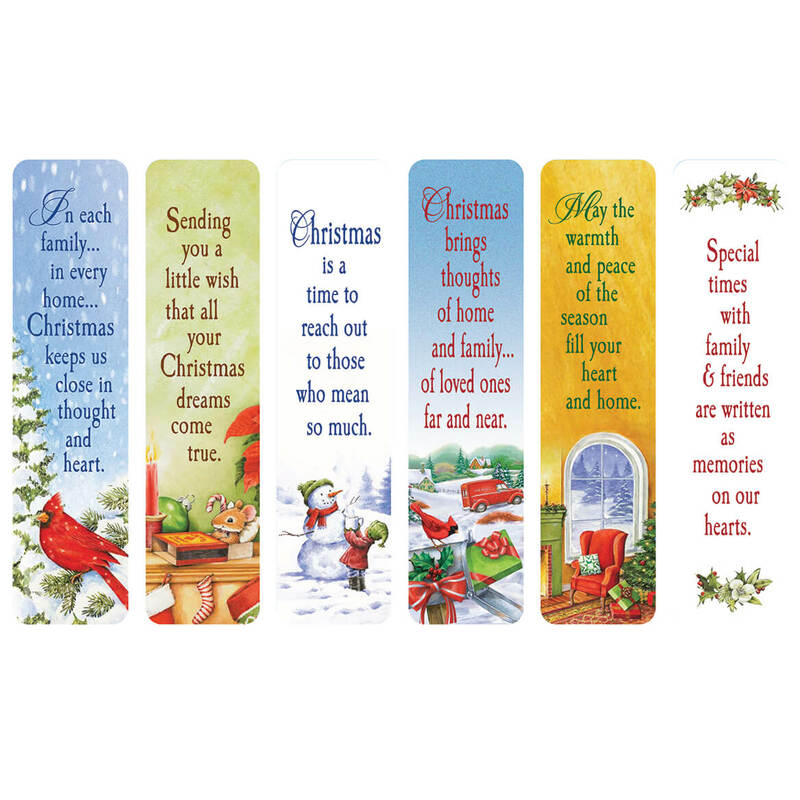 Set of 12 Christmas bookmarks features 6 unique secular designs with merry sentiments appropriate for any age. Card stock; 7″ long x 1 1/2″ wide. 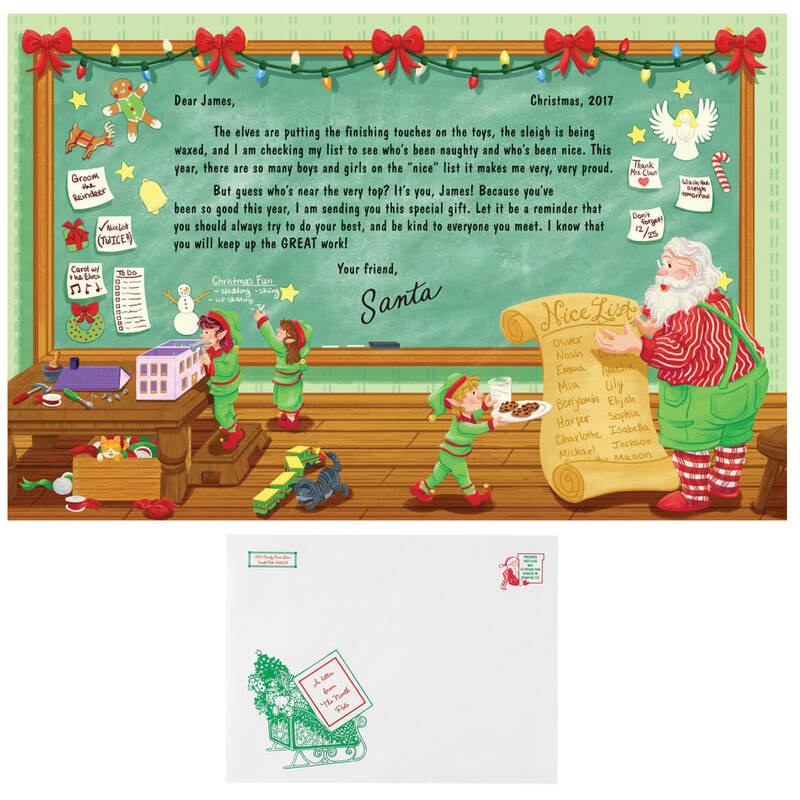 Your dated, personalized letter from Santa keepsake comes straight from jolly Saint Nick to one special child—wishing him or her a very special Christmas! Our letter from Santa includes a special holiday snowman ornament. Specify child’s full name and complete home address, city, state and zip. The letter from Santa Claus and Christmas ornament will be mailed in December. Place your order before December 10 to assure delivery before Christmas. No additional shipping charges to another address; shipping only available to the 50 United States. 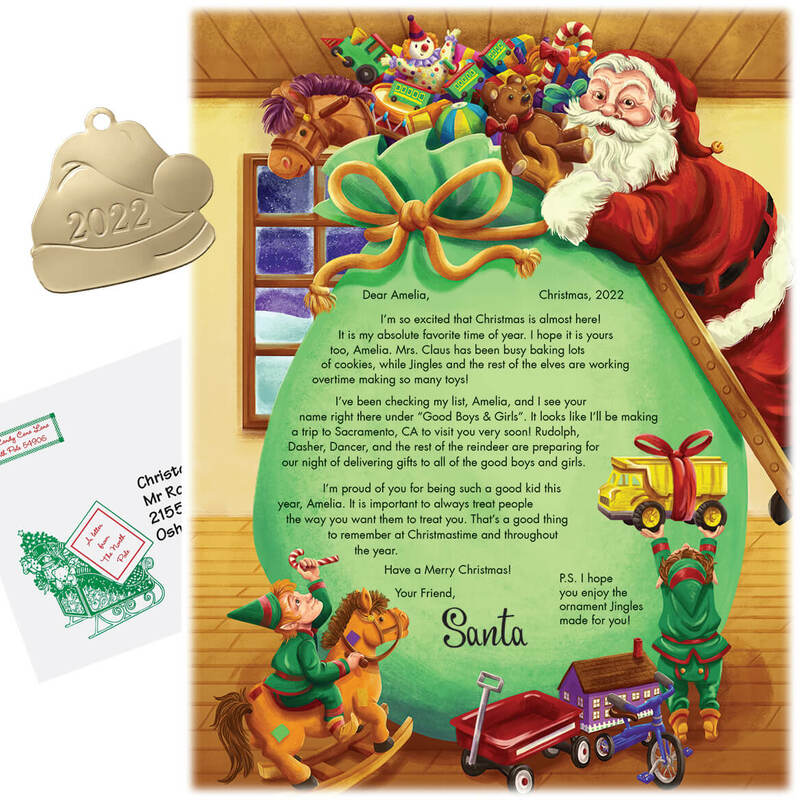 Your dated, personalized letter from Santa keepsake comes straight from jolly Saint Nick to one special child—wishing him or her a very special Christmas! 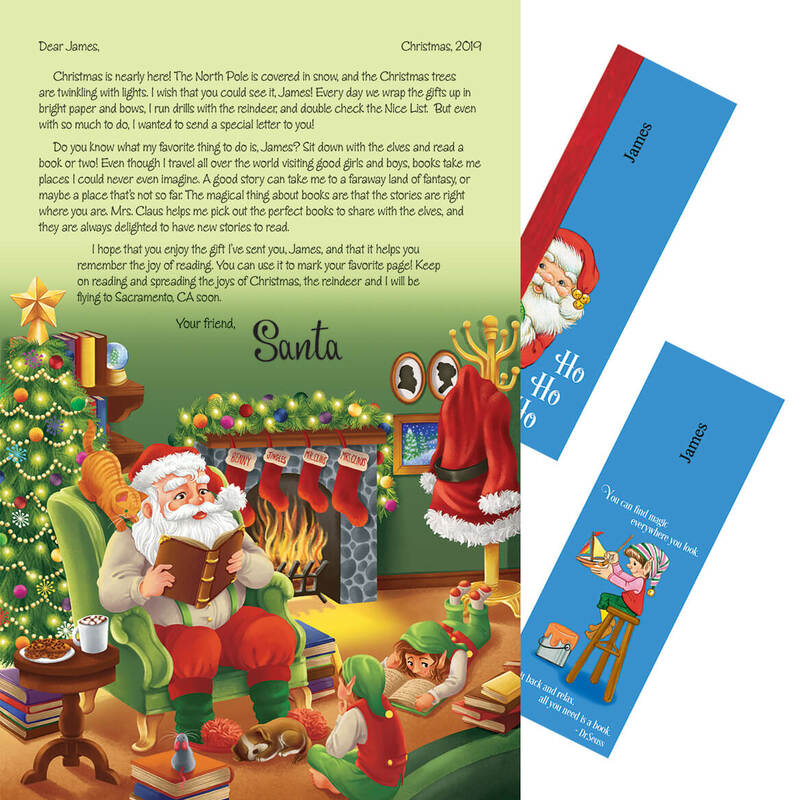 Our letter from Santa includes 2 special holiday bookmarks. Specify child’s full name and complete home address, city, state and zip. 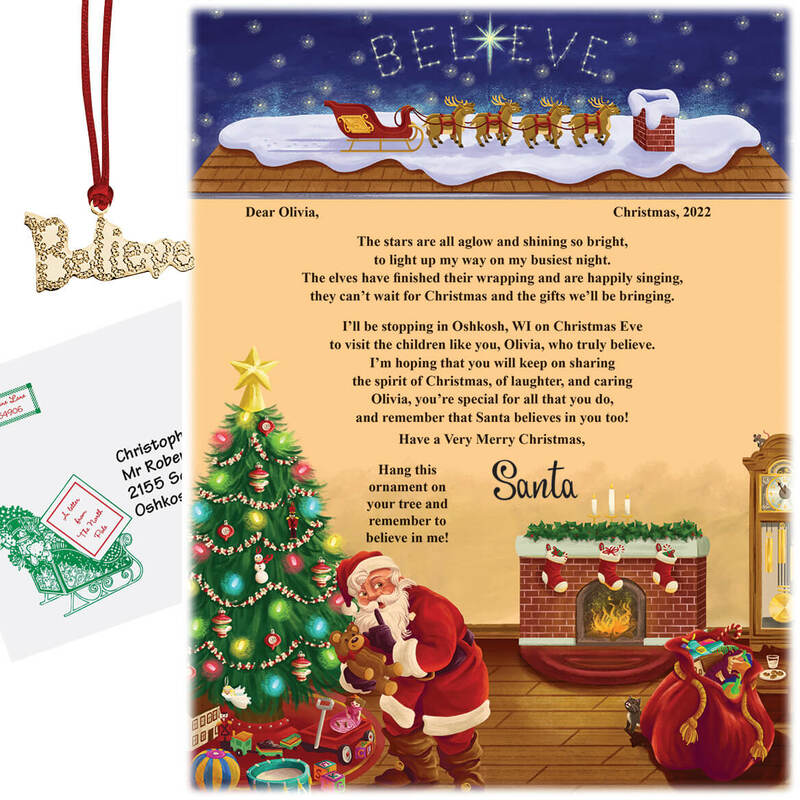 The letter from Santa Claus and personalized bookmarks will be mailed in December. Place your order before December 10 to assure delivery before Christmas. No additional shipping charges to another address; shipping only available to the 50 United States. 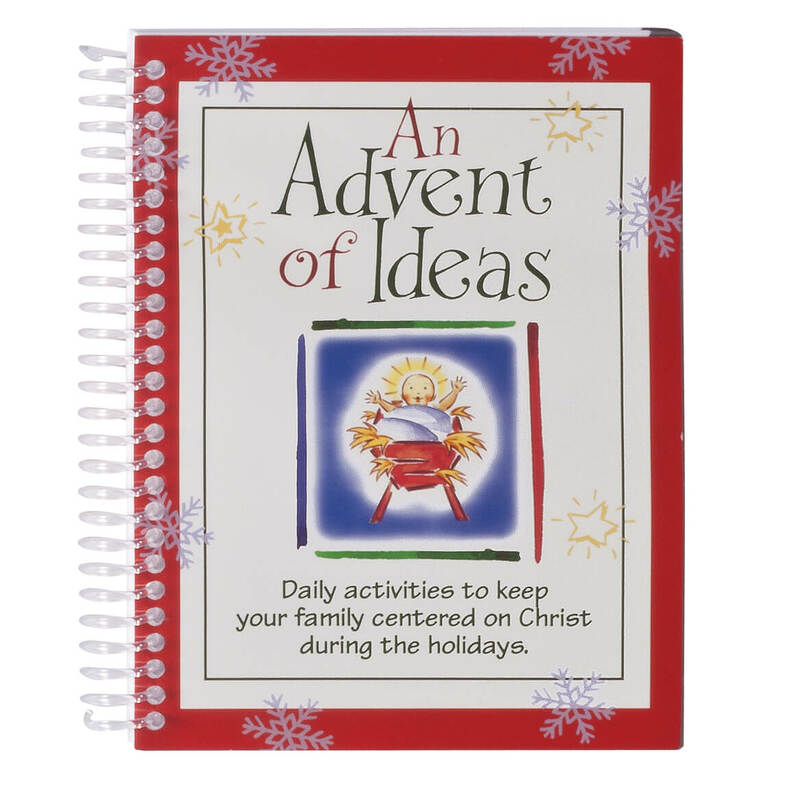 Keeping your family centered on Christ during the holidays, “An Advent of Ideas” Daily Activity Book is a gift that keeps giving—with memories to treasure forever. Suggesting fun ways your entire family can slow down and connect as you count down the days until Christmas, the countdown book includes daily activities using items you should already have around the house. Including Bible scriptures from the King James Version, this Christmas book can be enjoyed again for many Christmas seasons to come. 51 pages. 5″ wide x 6 7/8″ high. Deck goodies and gifts in something jolly—cute holiday treat bags with golden twist ties! 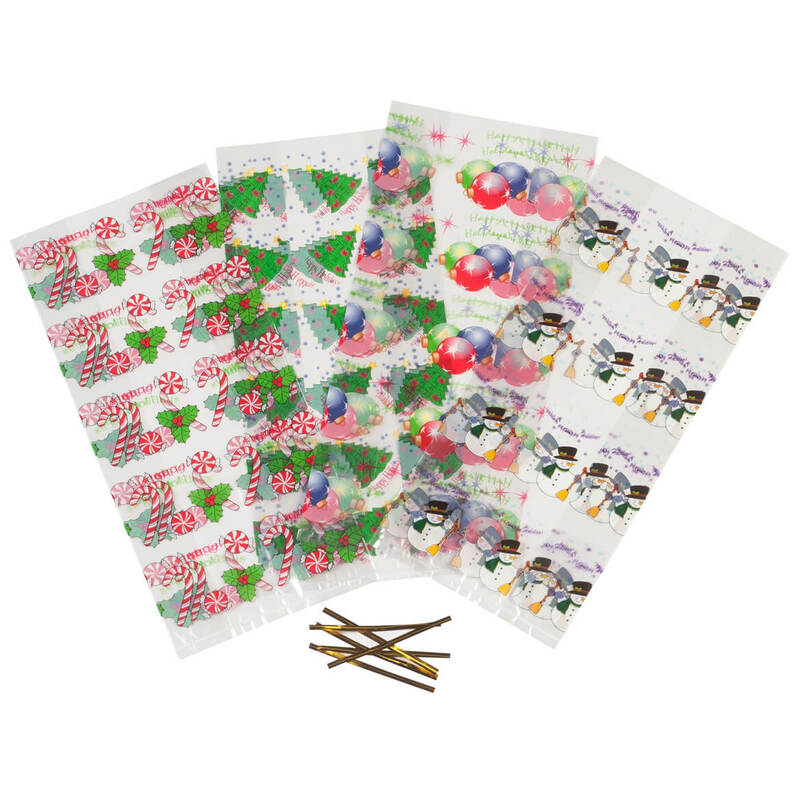 Boasting bright yuletide prints, our transparent gift bags are perfect for homemade cookies and candy, popcorn balls, spiced pecans and other holiday treats. The festive gusseted goodie bags are also great for presenting hard-to-wrap gifts like soaps, lotions, bubble bath, candles and more. Crafted of durable, tear-resistant polyethylene, the set of 60 includes 4 of each colorful design (ornaments, snowmen, trees, candy canes), plus 60 twist ties. 11 1/4″ x 4 3/4″. This letter from Santa to child is especially for the skeptic on your list. Santa letters to children of all ages, especially the young at heart, are filled with warm sentiments and reassuring wishes. Specify child’s name and complete address, city, state and ZIP. Santa letters will be mailed in December. Orders must be placed by Dec. 10 to ensure delivery before Christmas. No additional shipping charges to another address; shipping only available to the 50 United States. Ornament is 1 3/4″ x 1″. 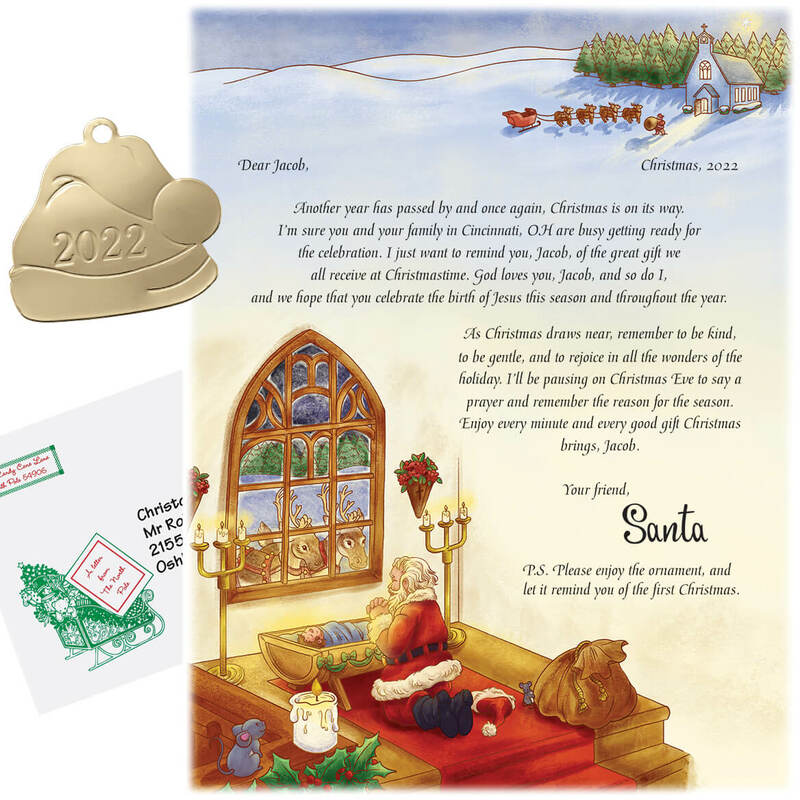 This Personalized Inspirational Santa Letter and Ornament keeps children focused on the real reason for the season, accompanied by a snowflake ornament engraved with the year. Specify child’s complete name and address, city, state, and ZIP. Letter from Santa will be mailed in December. Place your order before December 10 to ensure delivery before Christmas. No additional shipping charges to another address; shipping only available to the 50 United States. Express shipping not available. When George, Abe, Andrew or Ben peek through the cutout window of these festive Christmas money card holders, your gift of cash becomes extra merry! 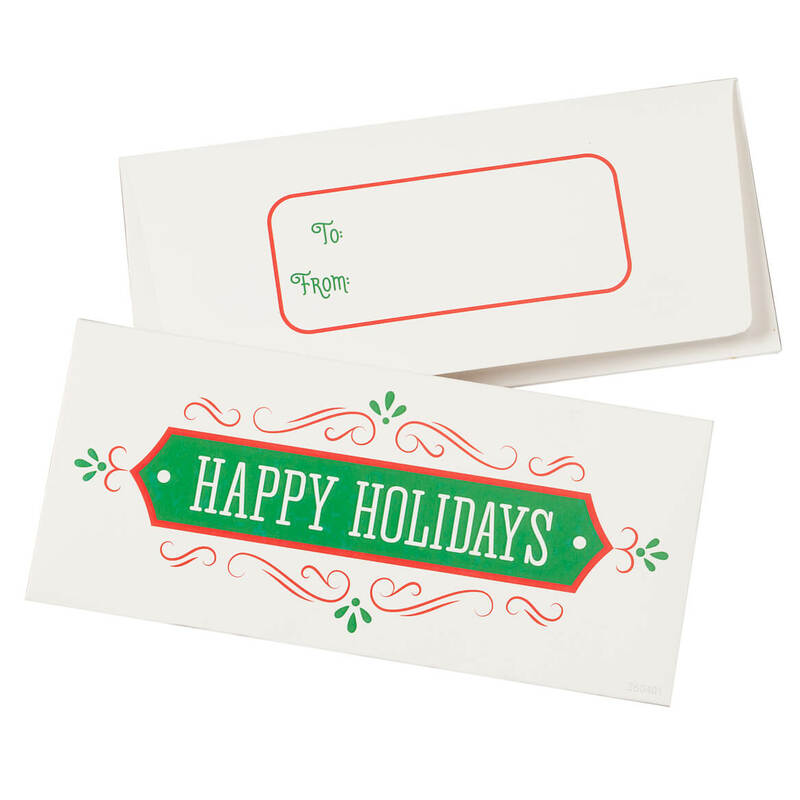 Featuring “Merry Christmas” greeting in front, these gift card holders open to reveal your gift of money inside. The value-priced set includes 12 cards, each with “To:” and “From:” printed on back. 6 3/8″ long x 2 7/8″ wide.